Location: Home › Music Articles › Vicki Yohe: A blue-eyed gospel diva who Seeks "the anointing"
Vicki Yohe: A blue-eyed gospel diva who Seeks "the anointing"
Like Martha Munizzi, VICKI YOHE is a blonde singer storming the US Gospel Charts. Tony Cummings reports. One of the heartening changes occurring in the US gospel scene is the gradual acceptance of white artists. Where once gospel was considered, by radio stations at least, exclusively an African American genre, today singers, spearheaded by that worship leader phenomenon Martha Munizzi, are scoring high in the Billboard Gospel Chart. Now another blonde singer, Vicki Yohe, has stormed the US gospel charts since signing with CeCe Winans' Pure Springs Gospel label. Ironically, Vicki is no newcomer. As she told US journalist Mark Weber, "I've been on the road travelling for 15 years. I had two other labels, Giant and Aluminum. They were small and just couldn't get my music out to where it needed to go. I felt like the gospel market was really my market and they just never knew how to do it. Thank God CeCe Winans learned of my ministry through seeing me on the Trinity Broadcasting Network (TBN)." Vicki was born in the wonderfully named Normal, Illinois in 1965. Her father was a minister and when Vicki was four the Yohe family moved to Rapid City, South Dakota for 10 years before relocating to Loranger, Louisiana. Vicki was always musical and remembers singing her first solo in church at age five. She and her sister Terri formed a duo that performed for years at various church convocations. At the age of 17 Vicki enrolled at Jackson College of Ministry and two years later became a music director at a church in Baton Rouge, Louisiana where she led an 80-member choir that turned out to be a steep learning curve. "I learned from that experience," she said, "and I grew in my walk with the Lord." Unknown to Vicki, her family raised the money for the singer to record an album and in 1992 her debut 'Vicki Yohe' was release independently. It was produced by her Minneapolis-based cousin Nate Sabin, a well known figure in Christian music who'd worked with such acts as crossover gospel hitmakers Sounds Of Blackness. Vicki's album brought her to the attention of CCM company Giant Records who signed the singer. For her Giant debut 'Everlasting Love', longtime songwriter friend Mark Caruthers pitched Vicki a song he had co-written with Steve Richardson and Jeff Harpole. He recited the words to Vicki and she agreed to record it before she had even heard the melody! "It was such a powerful message I had to record it," enthused Vicki. "The Mercy Seat" became a hit on American inspirational stations. Later, the song was to become an integral part of the Brownsville Revival in Pensacola, Florida where it was sung every night. Yohe herself sang the song at Brownsville on a few occasions. The ongoing success of "The Mercy Seat" effectively established Vicki on the US scene and she toured continuously while releasing the albums 'I Give You Me' in 1995 and 'He Known My Heart' in 1997. The latter featured the song "Comforter", later covered by CeCe Winans. Then worship leader Alvin Slaughter invited Vicki to appear on his TBN programme. The appearance with Slaughter was seen by TBN co-founder Jan Crouch, who began booking Vicki for the network's prime-time shows such as Praise The Lord. The TV exposure led her to the attention of Charisma magazine who invited Vicki to sing at a conference where Bishop TD Jakes was preaching. At the end of that evening the famed gospel patriarch asked Vicki to sing at a Woman Thou Art Loosed conference. Her TV exposure also led her to the attention of CeCe Winans, who offered Vicki the chance to sign with her new Pure Springs Gospel label (under the EMI Christian Music Group umbrella). At first Vicki wasn't sure about signing. "I was at the point where I had been out there for so long and I really wanted God's confirmation that I should sign. I felt like: I stay busy, I do over 150 dates a year, with or without a record label. God has just blessed me with favour with churches. I do a lot of conferences, Bishop TD Jakes, for instance. I don't say that to brag, I just say that God has really blessed me. I was at a point where I'd do my own CD, sell them on the road, minister to people on the road and if God would send a record label along that would really get the music to where it needs to go, then I would sign. So my husband and I prayed about it for six months before I signed with Winans. But I really wanted to know that it was God. I went to a conference at Winans' church. I sang a song that night. They had praise and worship. CeCe laid on her back, weeping all night in worship, and at 12:30 at night they carried her out and took her to her room. That spoke volumes to me. When I got home and talked with my husband, I knew without a doubt we should sign with her label." 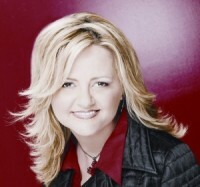 Vicki's 2003 release, '"I Just Want You' on Winans' label, had "the anointing," with songs like the Martha Munizzi-penned "Because Of Who You Are" and a re-recording of "The Mercy Seat" taking it into the gospel charts. One of Yohe's most moving songs on 'I Just Want You' is "Anoint Me Lord". Vicki explained, "I wrote 'Anoint Me Lord' when I was 16, and I'm 40 now. That song is my prayer. When people want to know about Vicki Yohe they should listen to that song. I prayed that in my closet when I was 16 years old and then I put it to music. I want God's hand upon my life. When I open my mouth to speak or sing, I want people's lives to be changed. I feel like if it's not going to do ministry, then why am I singing gospel/Christian music? Is it going to just be to sing a cute song? Why use that if it's not going to be ministry? It's all about ministry with me. I am a minister. I do exhort. My desire is to be anointed - that when I open my mouth to speak or sing that it's not 'just a song.' Song selection is so important to me." Another song from 'I Just Want You', "In The Waiting" had a profound effect on one listener. "A lady called the ministry and told us how she walked into her bedroom to find her husband sitting on the bed with a gun to his head. She said, 'What are you doing?' and he said, 'Our finances are messed up, our marriage is a mess, I just can't take it anymore.' She said, 'Wait, wait, you have to listen to this song by Vicki Yohe, 'In The Waiting.' He said, 'Ok, I'll listen to it.' She said she played that song and he put his gun down and began to weep. At the end of the song, the husband looked at his wife and said, "I'm going to wait on God." "That's ministry," says Yohe, "when you have a song that can save a life like that. That testimony of that lady who called has really done something to me." Vicki was asked how a blonde, white woman ended up with an African American singing style. "My father was a pastor of a mostly black congregation," she replied. "My father and mother both sang with a lot of soul. We always had Edwin Hawkins and Andrae Crouch playing in our house. That was the kind of music I grew up around. I'd record songs and felt like I was anointed but [creatively] I didn't feel like 'this is really me.' I struggled with that until I signed with CeCe Winans. I told the people at Winans' label, 'Listen, I know the music I need to be singing and I know the style and I just haven't had anybody who really hit it, you know?'" Thankfully, the folks at Pure Springs Gospel turned out to be the perfect match for Yohe's musical ministry. Vicki is particularly pleased with her latest album 'He's Been Faithful'. "I think that this new CD of mine is really Vicki," said the singer. "Out of all my CDs, this is really who I am. I'm so pleased with it." Sanchez Harley (Kirk Franklin, Aretha Franklin), Geron Davis (Barbra Streisand) and Ay'Ron Lewis (RiZen) all had a hand in producing the CD, which features several radio singles, including "Deliverance Is Available To You", "I Simply Love You" and "I'll Run To You", along with a duet, "Increase Me", featuring Alvin Slaughter. But it's the title track that stands out. It was penned by Carol Cymbala, the director of the Brooklyn Tabernacle Choir. Yohe decided to record "He's Been Faithful" after adopting her first child in March 2005. When she and her husband, Troy Hodges, were trying to decide what to name the new CD, they agreed that 'He's Been Faithful' would be the perfect title. "I've used the song for 18 years," commented Vicki. "I just love it. After being married for nine years - no children - praying desperately that God would give us a baby, my friend Darlene Bishop, from Ohio, who works with teen mothers, called me and said she'd have a baby for us in one week." Bishop told Yohe that the birth mother had just turned 16 and was going to give the baby up for adoption because she didn't have anything to offer it, and her racist father was opposed to his white girl having a bi-racial baby. Said Yohe, "So I went there the next day and met this young lady. And the next week I sat by her side and I cut the cord and I was the first one to hold him. So the Lord has been faithful to me. I've been singing all these years and finally it's the right time, the perfect time to title my CD 'He's Been Faithful' because I have the most gorgeous bi-racial baby boy, Walker Winston Hodges." In all seriousness, Yohe says her son will be the President of the United States. If that doesn't happen, she is sure that "he will lead people one of these days - the hand of God is all over him." Little Walker already has his own website, www.walkerwinstonhodges.com. On the site there are pictures of Walker with bishops, pastors and singers, people like Yolanda Adams and Bishop TD Jakes, who dedicated him to the Lord. Besides singing in churches, at conferences, and taking the time to promote 'He's Been Faithful', Vicki is also involved in opening an orphanage in Uganda. In order to stay spiritually strong, Yohe stays grounded in the Word of God and encourages those she meets to do the same. "I don't know how you could even exist in the time we're living without getting into the Word of God," she said. "With the things the world's faced in the last few months or so, we need Jesus now more than ever." Vicki you are truly and angel from heaven when you sing its like I can see every word come out of your mouth visually as if you are creating a movie that I can see.I would love to meet you one day.You are a true inspiration to me.Thank you for being obedient to God.Stay saved. i think you are truly blessing and when i listened to jehovah jireh my provider and here in this house it move me. Continue to be a blessing to others i just love your voice god bless you. Vickie I love your music,and it touches me very much.I to sing,my husband is a minister,Rev.Johnny Peacock.He also sings and is so blessed and anointed by God.I have been singing since I was 9 in my fathers church.Your style of singing is a lot like mine.I love the words to your songs because they reach your heart and bless.Sometimes when I am feeling low I will listen to your songs and feel so lifted up.Some are more special than others,but I love them all.He`s Been Faithful is one of my favorites.I Just Want You,Mercy Seat,Here In This House,and DeliveranceIs Available.There are more but these are some of the ones that really touch me.I received the Holy Ghost at the age of 7 and I lived for the Lord every since.I would love to know when you are going to put out another CD.If possible I would love a list of all the CD you have made.I got some of your CD from a good friend of my husband`s, Rev.David Huff,from Lemon Miss.As a teenager my husband met your father at PBI Tupelo,Miss.We live in Macon Ga.and work in my brothers church(Rev.Bill Davis. )at the World of Faith.I do love and appreciate your music. God Bless You and Your Music. Vicki You are such a "Great Lady". My daughter came to visit this weekend, Sharon Moore from Hope Academy . She tells me you Son is just so beautiful. may God bless you always . Vicki you are an amazing singer. You take us with your rendition directly to the Throne Room. God Bless...and may many more songs come forth out from you.........just the thought of your renditions gives goose bumps....wow..God Bless you !! she is a blessing and i love the article. God will bless her. love the music and worship, true blessing- you are such a source Vicki. Blonde diva Vicki Yohe releases 'He's Been Faithful' album.